That bumper you've got? It's looking a little... stale. A little saggy. What your iPhone 4 really deserves? A smooth and shiny chrome slider case. It's purty. The 1mm thick cases don't add much bulk at all, and while I might have some long-term concerns about fingerprint smudges and scratches and scrapes, I'm going to set them aside for now. 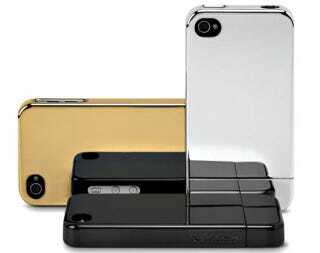 Because for as long as those black and silver chrome cases are in pristine condition, they're some of of the sexiest iPhone 4 outfits I've seen. As for the gold and purple (yes, purple) versions, well, you'll certainly be making a statement.